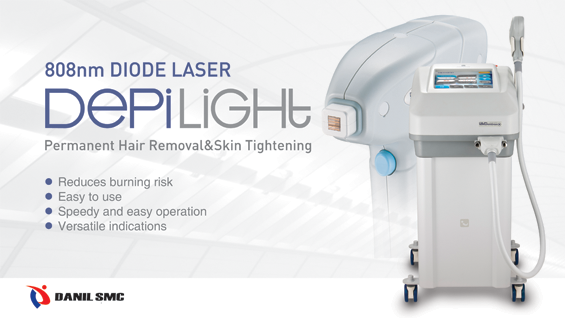 ▶ Past medical history and family history: The patient received CO2 laser 3 times for a year at a private clinic. 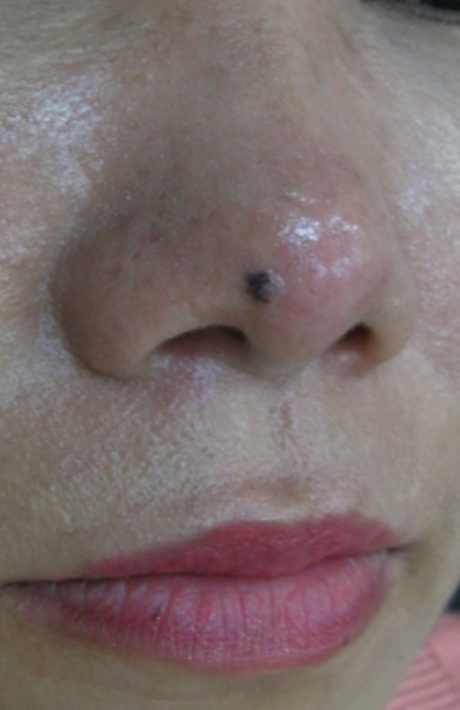 ▶ Skin findings: Black nodule was observed at the tip of the nose (Figure 1). ▶ Histology findings: Basal cell carcinoma of pigmented, nodular type was diagnosed by punch biopsy (Figure 2). ▶ Surgical finding: Mohs surgery of the first stage with 4mm margin was performed, and the patient has been completely recovered without recurrence. Mohs surgery will be described in details in the following case series. Excluding the differential diagnoses to be made by visual inspection with experienced eyes (macroscopic examination) (Table 1), the necessity for histology should be determined and the diagnosis should be confirmed by histology. In order to reduce errors in visual inspection and to determine the necessity of histology, the following objective approach should be exercised in addition to the intuitive approach than depends on experiences. 1. Macroscopic observation– the lesions should be analyzed and diagnosis should be made according to the following ABCD rule. 2. 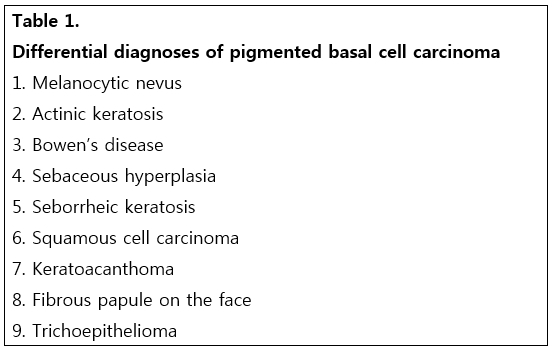 Diagnosis using Dermoscopy, Dermatoscopy, Episcopy: Characteristic findings of pigmented basal cell carcinoma on clinical photographs and on dermoscopy (see picture below) should be acquainted and diagnosis should be made considering racial difference. 1) Typical characteristic findings of basal cell carcinoma: Ulceration, Ovoid blue nest of pigmentation, Spoke-wheel structure, Arborizing telangiectasia, Maple-leaflike areas. 2) Asymmetry of color and structure, multicomponent global pattern, irregular brown globules, irregular streaks, irregular bluish-black blotch and regression are findings detectable in malignant melanoma and require differentiation. Spoke-wheel structure, on the other hand, does not appear in malignant melanoma and is often detected in basal cell carcinoma, allowing the diagnosis of basal cell carcinoma. Globules mean a melanotic lesion. 3) Recent studies reported more varied findings for darker pigmentation, and dermoscopy specialists made accurate (98% sensitivity) and reliable (87%) diagnoses (JAAD 2010;62:67-75). Pigmented basal cell carcinomas grow in superficial or nodular shape, and grey, blue or brown colors are observed in all or part of the lesion. 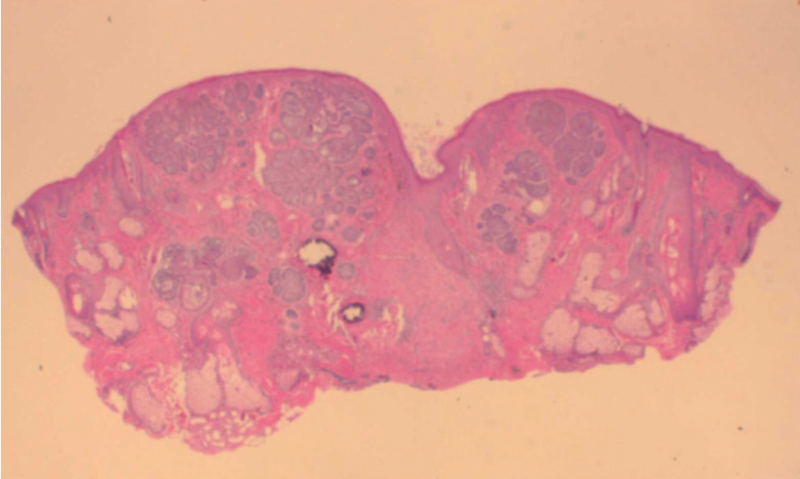 Therefore, differentiation with malignant melanoma is a necessity in Caucasian patients and histology should be performed always before removal. On the other hand, early phase lesions are very similar to typical melanocytic nevus among Asians including Koreans, rendering the lesion very easy to be missed, as often experienced recently. According to the medical history, most patients removed the nevus for aesthetic purpose but experienced recurrence several time. During aesthetic nevus removal, it is hard to differentiate among malignant melanocytic nevus, dysplastic nevus, malignant pigmented basal cell carcinoma as in the above case, and early stage malignant melanoma with the naked eye. Among non-white Asians, pigmented lesions on the face are mostly common lesions, including pigmented nevus such as freckles, melanocytic nevus, seborrheic keratosis, solar lentigo and sebaceous hyperplasia, making it easily removed based on simple clinical determination without detailed differentiation (Table 1). On the other hand, it is a necessity to differentiate black spots in Caucasians with malignant melanoma, because the differentiation is forensically important in Western countries including the US. Therefore, periodic skin examination of the whole body by a dermatologist and an approach for early detection, such as histology for suspicious lesions, are established as a standard practice guideline. However, malignant melanoma on the face is very rare in non-white Asians including Koreans. When a black spot is present on the exposed area of the face, as in the above case, more common pigmented basal cell carcinoma should be suspected first before malignant melanoma. Pigmented basal cell carcinoma is common among Asians because of the activity of melanin pigment cell and the difference of melanin pigment cell in the melanosome. 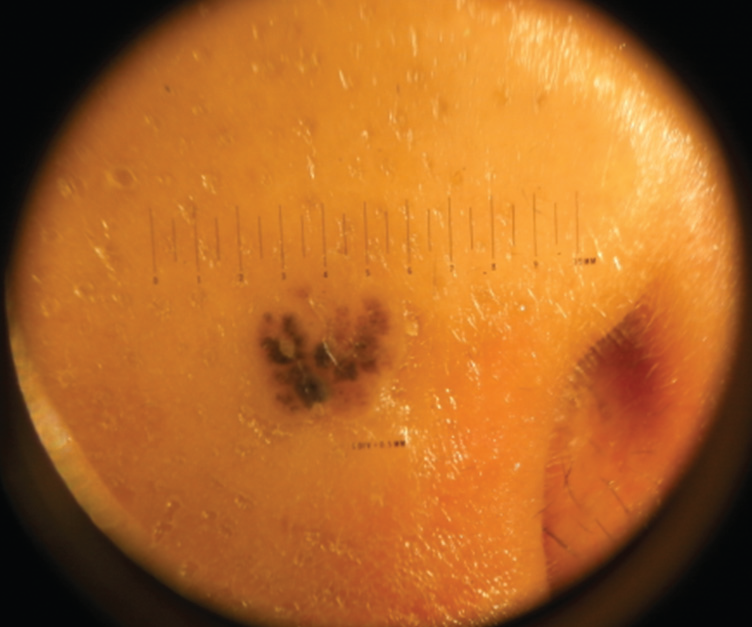 When examining a patient chiefly complaining of pigmentation or a nevus, close macroscopic examination using an objective approach should be performed before conducting a procedure unlike in the past. Currently available methods for early differentiation of benign and malignant lesions (actinic keratosis, Bowen’s disease, keratoacanthoma, basal cell carcinoma, squamous cell carcinoma, etc.) are macroscopic examination using the ABCD rule and finding microscopic subclinical infiltration change using noninvasive dermoscopy. Knowledge and understanding gained from cases as above would be of great help in detecting clinical characteristics certainly distinguishable from typical nevus, so as to prevent unnecessary procedure, surgery or inappropriate treatment, and in performing histology in the early phase, so as to recover the lesion by early diagnosis and treatment without missing early skin cancer, such as melanoma. 1. Jae Hong Park, Jeung Tae Jeong, Hae Jun Song, Chil Whan Oh, Il Hwan Kim. Case Report : Diagnostic Trial of Epiluminescence Microscopy in Two Cases of Pigmented Basal Cell Carcinomas. Annals of Dermatology.2001;39(10):1127~1132. 2. Peris K, Altobelli E, Ferrari A, Fargnoli MC, PiccoloD, Esposito M, et al. Interobserver agreement on dermoscopic features of pigmented basal cell carcinoma. Dermatol Surg 2002;28:643~5. 3. Telfer NR, Colver GB, Morton CA. Guidelines for management of basal cell carcinoma. Br J Dermatol2008;159:35~48. 4. Altamura D, Menzies SW, Argenziano G, Zalaudek,Peter Soyer. Dermatoscopy of basal cell carcinoma: Morphologic variability of global and local features and accuracy of diagnosis. J Am Acad Dermatol2010;62:67~75.